Pneumatic riveters are used to assemble or join two parts, with a single rivet. It involves a firm pressure so that both components are coupled. If you want to join elements on both sides, you make a solid rivet. But if the piece will be joined to a solid side, it is called blind rivet, since there is an additional part for this operation, in the mouth of the riveting machine. Pneumatic riveters, mostly industrial riveters, are usually very light and use less air than other types of riveters. The manual pneumatic riveters which are those that we operate simply and that are light because they are used with the hand. There are several models of this type. Depending on the model, there are those that come with a nail collecting cup, a rod suction system, a rivet counter, a cycle counter, etc. Also, according to the model, the nozzles can be changed, which allows us to use rivets of different sizes. There are efficient pneumatic riveting machines that use less air. On the other hand, depending on the manufacturer and model, we will find lighter riveters than others. These types of riveters are industrial. Pneumatic riveting machine for threaded inserts. It is one of the smallest models, weighs just over a kilo and a half, so it is easy to handle. The characteristic of this riveting machine is that it allows assembling a piece automatically. Pneumatic impact riveting machine. These are riveters that although very light, are also very resistant for the works to realize. They achieve depths of up to 12". 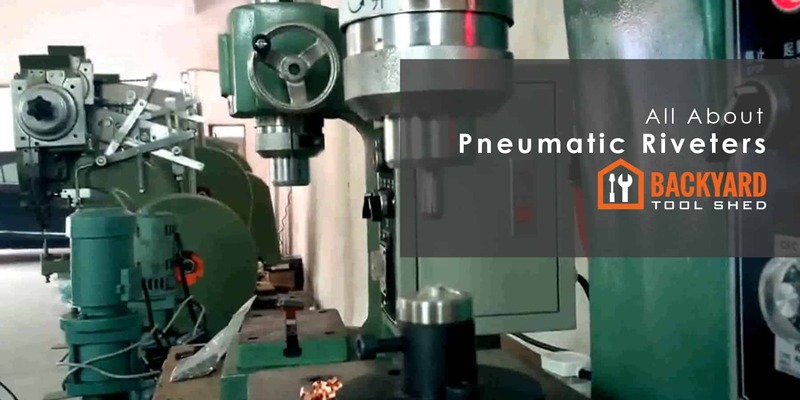 Pneumatic riveting machine using radial metal deformation. Used for any assembly. Its head makes sturdy but soft rivets at the same time which do not mistreat the fibers used. A pneumatic riveting machine with double radial metal deformation. It is a version with a standard head. Its force can be adjustable, as well as its speed. It has a stroke counter. Pneumatic riveting machine for threaded hexagonal inserts. In its head has an exclusive zone, which serves to convert the round hole, already made, into one of hexagonal form.